SpaceX continued its impressive rate of launch Monday morning with the flight of the Telstar 18 VANTAGE communications satellite from Cape Canaveral Air Force Station’s Space Launch Complex 40. It marked the 16th launch for the company this year with nine more still on its manifest for 2018. SpaceX utilized a new Block 5 Falcon 9 for this heavy 15,564-pound (7,060-kilogram) payload. The Block 5 is the company’s newest variant of the rocket, debuting in May, and is characterized by its higher trust on all engines, improved landing legs and flight control systems. Because of inclement weather and a lightning advisory, the launch was postponed some 77 minutes into the four-hour-long launch window, which opened at 11:28 p.m. EDT Sept. 9 (03:28 GMT Sept. 10), 2018. The T-minus zero time was reset first to midnight EDT (04:00 GMT), but then to 12:30 a.m. (04:30 GMT) and finally 12:45 a.m. EDT (04:45 GMT) Sept. 10. The final leg of the road to launch occurred the morning of Sept. 5. At 10 a.m. EDT (14:00 GMT), Spacex engineers filled the two-stage Falcon 9 with a mixture of super-chilled kerosene and liquid oxygen and conducted a successful test firing of all nine first stage Merlin 1D engines. Once complete, the rocket was returned the nearby horizontal integration hanger to attach the payload fairing-encapsulated Telstar 18 VANTAGE. After the weather-related delays on launch night, fueling of the 229-foot (70-meter) tall Falcon 9 began. 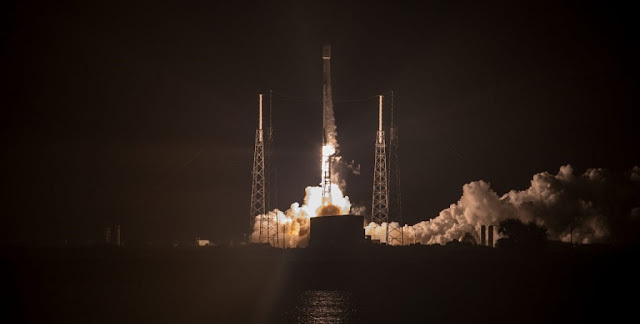 SpaceX’s launch director gave the go-ahead to begin fueling the rocket at about T-minus 38 minutes before the 12:45 a.m. A few minutes later, the RP-1 rocket grade kerosene fuel and liquid oxygen began flowing into the rocket. As the minutes ticked by, the rocket’s engines were conditioned for flight as the tanks finished filling with their propellants. Just one minute before liftoff, the rocket’s flight computer checked to ensure all was nominal for the mission to get underway as the propellant tanks were brought up to flight pressure. Fifteen seconds later, the launch director confirmed that the launch could proceed. The countdown reached T-minus zero and a bright orange and yellow flame lit up Space Launch Complex 40. After lifting off the pad, the rocket arced out over the midnight sky above Florida to send the Telstar 18 VANTAGE satellite on its way to geostationary transfer orbit. Around a minute after leaving the ground, the vehicle reached “Max-Q,” an area of the flight where the pressure of the atmosphere being exerted on the rocket and its payload were under the greatest amount of stress—maximum dynamic pressure. Some 2.5 minutes into the flight, the nine first stage Merlin 1D engines finished their job of sending the second stage with the satellite toward orbit. Shortly thereafter, the first and second stages separated. It was now the second stage’s time to begin its powered flight. Its lone vacuum-optimized Merlin engine began firing shortly after stage separation. About 3.5 minutes after leaving Florida, the payload faring (the rocket’s nosecone) that shielded Telstar 18 VANTAGE through most of Earth’s atmosphere was jettisoned. Finally, at about 8.5 minutes into the mission, the second stage cut off as planned, placing the satellite payload into a low-Earth parking orbit. Meanwhile, upon completing its part of the mission, the Falcon 9’s first stage continued on its suborbital trajectory, performing an entry and landing burn to safely touchdown on the surface of the autonomous spaceport drone ship “Of Course I Still Love You,” located some 395 miles (635 kilometers) downrange in the Atlantic Ocean. After coasting in orbit for about 18 minutes, the second stage’s engine came to life once more for a 45 second burn to place Telstar 18 VANTAGE into a geostationary transfer orbit. At a mission elapsed time of 32 minutes, the spacecraft was released. The Telestar 18 VANTAGE spacecraft is an advanced high-throughput satellite built by SSL of Palo Alto, California for Canadian company Telesat. In the coming days and weeks, it will use its own propulsion to establish a circular geostationary orbit where it will enhance broadcast capabilities through much of the developing markets of Asia with its Ku-band antennas and allow direct connectivity from Asia to the Americas with its broad C-band coverage. The article is very interesting to me.